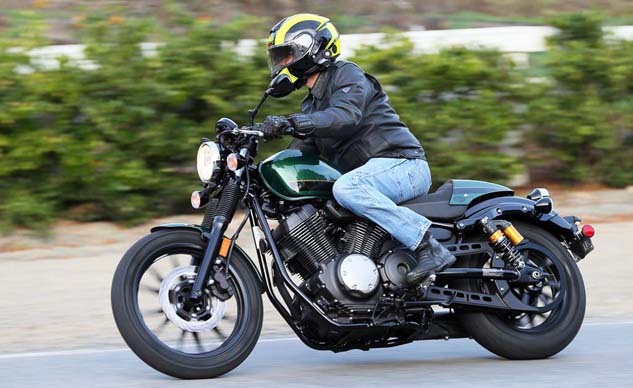 Star Motorcycles has added to its pair of performance bobbers, the Bolt and Bolt R-Spec, with the 2015 Bolt C-Spec. However, when you have a model line that’s selling well, you don’t want to change it too much. So, Star massaged a little cafe racer into the Bolt’s attitude. While the power train remained the same, the pulled back bar was tossed and replaced with clip-ons. The pegs were moved 6 in. rearward, and the passenger accommodations are swapped for a sporty seat cowl. The front and rear suspensions were bumped in length a tad to gain some cornering clearance, resulting in a Bolt that likes to go around corners a little more than its older siblings. This from-the-saddle video review and the accompanying road test will tell you everything you need to know about the Bolt C-Spec. Get price quotes for Star from local motorcycle dealers.